Clint Burke (left) and RJ Carenates (right) helped lead the Eagles to a 4-3 win over the Sluggers. Photos by Josh Belanger. 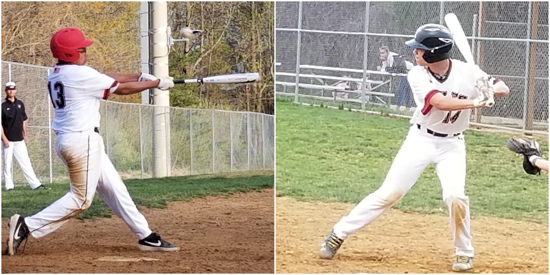 Clint Burke provided the game-winning RBI in the bottom of the seventh inning, hitting a deep sacrifice fly to left field that scored pinch-runner Eric Gomez to lead the Bradley Eagles 13u over the Annandale Sluggers 13u, 4-3, last night at Nottoway Park. Burke hit the ball hard all three times he stepped to the plate, going 2-for-3 with a pair of RBI and runs scored. After a base hit in his first at-bat, Burke ripped an RBI double over the left fielders’ head that tied the game at 2-2. He had a similar result in his final at-bat, finding contact on a 3-2 pitch to win the game for the Eagles. “I was just trying to stay back during the entire game,” Burke said. “[In that last at-bat], I fouled a couple pitches off and I was just trying to work in, but if the pitch was outside, also trying to hit it [the opposite way]." AJ Murray started on the mound for the Eagles and struck out four over three shutout innings, allowing just two hits while walking none. Murray would also later drive in Burke to give the Eagles a 3-2 lead in the fourth. Sluggers starting pitcher Jamie Laskofski also showed suburb control in his outing with just one walk over six innings. The right-hander was hit with the no decision after he limited the Eagles to three runs on three hits. He also went 1-for-3 at the plate with a run scored for the Sluggers. Jake Drumm delivered the first lead for the Sluggers with a two-run double in the fourth off Eagles reliever Jordan Sim. The Sluggers would again rally in the sixth, tying the game on an RBI from Bryce Williams after Gavin Keller led off with a base hit, however would have the go-ahead runner thrown out at the plate on an attempted first and third play. Patrick DeYoe came on after Sim allowed three runs over thee innings to record the final three outs. The right-hander showed poise as he faced runners in scoring position with one out, but induced a couple of fly ball outs and kept the game knotted at 3-3 in the seventh. Reliever Jalen Hoffman would take the mound for the Sluggers in the seventh and made a crucial mistake to walk catcher RJ Carenates to start the inning. Gomez, who became a courtesy runner for the catcher, stole second and later advanced to third on a wild pitch to set up Burke for the walk-off opportunity. The Eagles will be in action next against the NOVA Vipers on Saturday while the Sluggers will play the Arsenal on Tuesday, April 23.